I have been considering letting go of some of the bikes in my garage this spring, in order to make room for some new ones. In particular, replacing my old 1999 Honda VFR800 with something a bit more upright and adventure-oriented. With winter weighing down on us here in the Northeast, it’s the perfect time to fire up the kerosene heater in the garage, crack open a beer, and take stock of what is currently in the stable. Sipping a strong winter ale and eyeing the old Veefer, I recalled our first trek together. It was early April, 2012. 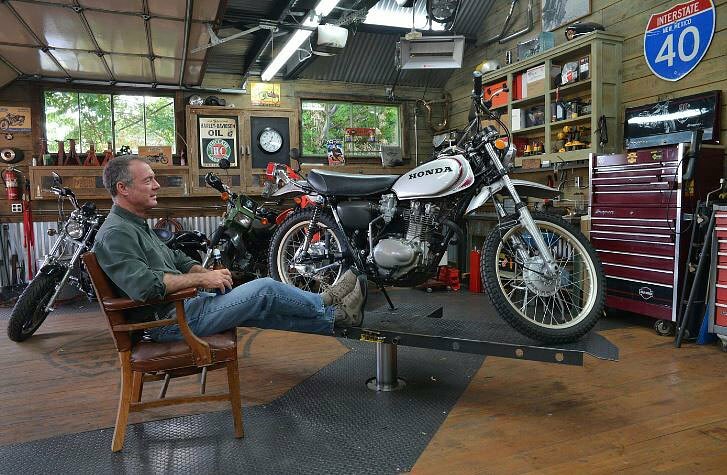 A fellow looking to spend more time in the dirt than on the street had traded in the Veefer on a Honda XR650L at the motorcycle shop in northern Nashville where I was employed. The ink wasn’t even dry on my paycheck before I signed it right back over to my boss in exchange for the Honda’s title. Timeless lines. The fifth-generation VFR800 is simply my favorite. Photo by Spurgeon Dunbar. While the “Honda Red” paint was in almost showroom condition, the bike needed a little love, mechanically speaking. After I replaced the worn steering head bearings, chain and sprockets, and faulty starter switch, and added a new set of dancing shoes in the form of Pilot Road 3 tires, she was ready for our first voyage. I took a day off from work. I left home on Tuesday night and at dawn on Wednesday I was sipping my morning coffee near the entrance to the Cherohala Skyway in eastern Tennessee. That's where I met Dave and Charlie. These two guys were easily in their 60s, wearing wild grins and riding a Ninja 1000 and Suzuki GSX-650F, respectively. Taking a peek at the ol' paper map makes a good excuse to stretch the legs. Photo by Spurgeon Dunbar. Dave and Charlie had stopped while making their way back home to Indiana after doing a few track days in Georgia. They traveled with a rig that housed not only their track bikes, but also a pair of street bikes, so they could ride at destinations along the way, planned or otherwise. “It’s a great way to explore local roads and highways. We love parking the trailer at Deals Gap, unloading the street bikes, and then riding down into the mountains of northern Georgia,” Dave explained, taking a final sip from his coffee cup. Best riding of my life, eh? Who could turn down such an intriguing offer? Not this guy. Thanks to the Tennessee Valley Authority, dams turn valleys into lakes in these mountains. Photo by Spurgeon Dunbar. And with that, we were off. It became clear very quickly that their idea of “50 to 60 percent” was more like 120 percent of my riding ability. These guys were awesomely fast. They selected their lines perfectly and launched their bikes through corners without a hint of hesitation. I kept up, but barely. Making our way across the Georgia state line, bouncing from one numbered highway to the next, we turned onto a small road (which I found later on the map as Georgia Route 52). I noticed a sign warning trucks of the upcoming curves and switchbacks, with posted recommendations for the faint of heart to reverse course. With that, the Chattahoochee National Forest was suddenly transformed into a blur of twists and turns. The suspension was a bit soft and the ol’ gal was carrying a bit more weight than some of the younger models on the road, but I quickly saw why so many hold a special place in their hearts for the fifth-generation Veefer. Those gears driving the overhead cams sound like a supercharger winding up as power is delivered seamlessly to the rear wheel throughout the entire rpm range. With a handful of throttle, the engine pulls hard from 6,000 rpm all the way up to the redline at 12 grand. Dips, dives, sweepers, and hairpins, the VFR attacked them all with ease, her engine snarling with delight. There is one gas station in Suches, Ga., and I have never seen the cars in the parking lot outnumber the bikes. Photo by Spurgeon Dunbar. After a quick stop in Suches, Ga., for gas and a Coke, we made our way over to Helen for an early dinner. The roads connecting the two towns were another mass of curves and a splattering of numbered highways. Route 348 was one of the most amazing stretches of blacktop I have ever ridden. Dave and Charlie took a considerable lead, and by the time I reached the restaurant, they were already dismounting from their machines and waving me in. Over burgers and iced tea at place called the Hogpen Gap Grill, they explained, laughing, that Charlie, 73, had been a semi-professional road and flat-track racer and Dave, comparatively spry at 64, averaged almost as many miles on the track each year as he does on the street. Retired? Of course. Good food, good stories, and new friends. Never shy away from adventure. Photo by Unidentified Waitress. After a meal spent entertaining each other with tales of favorite roads and moto adventures, I followed them for 115 miles on the “fun way home” back up to Deals Gap. By the time we hit the parking lot, the signs of light in the sky were nearly extinguished. Before our engines had cooled, Dave was offering up rum cocktails in Dixie cups and a spare bed for the night. Unfortunately, I had to respectfully decline, as I was due back to Nashville for work in the morning. The sun setting over the Smokey Mountains as we made our way back to Deals Gap. Photo by Spurgeon Dunbar. Miles to go on wide-open I-40 on a used VFR that ate up freeway miles with the same ease it had attacked the most ridiculously twisted roads earlier that day. By the time I pulled into the garage that night, I had put over 800 miles on the bike in less than 36 hours. That was almost three years ago. Now, I strain to recall the warmth of the southern sun as I huddle by my kerosene heater while the snow continues to fall outside. It may be dangerous to sit here reminiscing. One can quickly become nostalgic. I mean, I could always add the adventure-style motorcycle to the garage without getting rid of the VFR, right? What is one more bike in the garage gonna hurt?